For discussion of the issues faced when building a model or layout - how to replicate wood, what glues to use, exactly how much weathering can a Gnat take, a good source of detailing accessories - you get the picture, I'm sure. Location: Black Country, UK - NOT Birmingham! Interests: GN15!, Zak and Travis my Border Collies, Steam Rallies and Canals. A long time ago I'm sure there was a piece in Railway Modeller about this beast. Can't recall for definite but I'm pretty sure it ran on 9mm track. It was said, of the real one, its operational practicality lacked somewhat but as a symbolic gesture I'm sure it won many over. Make a good model though. Gn15: Remember SIZE does matter! and may all your gauges be little ones. Interests: narrow gauge modelling, 009, 09. On each armoured wagon, the ring mount had a Boyes anti-tank rifle and a Lewis machine gun. At the other end there was a Lewis machine gun on an anti-aircraft pintle mount. 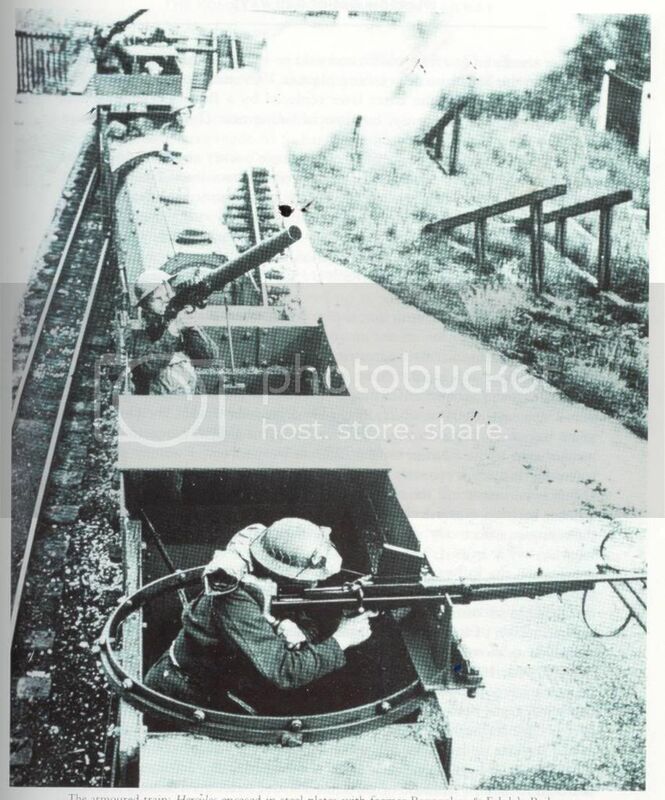 Regarding the queries about the ordnance in the RHDR armoured train photo - the one that "looks like a drainpipe" is a .303 Lewis gun - the thick barrel is the water cooling jacket around the rifle barrel. These were WW1 section level light machine guns that were replaced during WW2 by the much better Czech designed Bren LMG, but they were kept in service due to exigencies of war and were often used with shoulder mounts on a tripod as light anti-aircraft weapons. They were available with either drum magazines or could be belt-fed. Their main problem was that they were very complicated, suffered from overheating on sustained fire and often seized - not very confidence building when used in defence! The larger weapon with the box magazine on top is a Boys, or Boyes .5 inch calibre anti-tank rifle. These were often fitted to light universal carriers (misnamed Bren carriers by Airfix!) and were used by the BEF in France. Not very effective although the solid shot could penetrate the thinner armour of scout cars, Pzkw 1 and II etc. They were shoulder-supported in the same way as a standard infantry rifle would be and were reputed to have such a vicious kick that they caused almost as many casualties to the home team as they did to the enemy! They worked on single-shot and the magazine carried just 5 rounds I think, although all this is from the top of my head as even with my 46 years service to Queen and Country, I don't remember them first hand and I would stand corrected on any of it if someone who knows better emerges! I should have checked Dana's Wikipedia link above before committing to waffle as both the Boys description and a link to the Lewis gun through "British infantry weapons of WW2" gave very full, comprehensive and as far as I can see, accurate descriptions. Much better than my top-of-the-head attempt anyway, but I was suitably relieved to discover that most of what I said was indeed correct! Thanks all, I recognised the Boyes but had not seen a Lewis gun from the dangerous end. I think but may be wrong, that Hercules was a pacific not an 0-4-0. However, I agree it may be a good starting point for a "in the style of" armoured train with 4w hoppers instead of bogie stock? I seem to remember the was an article in an edition of the Tome. Last edited by Simon Andrews on Thu Jan 24, 2008 2:40 am, edited 1 time in total. There is no direct "Thomas" lookalike The loco under the armour was "Hercules". It was a 4-8-2. See http://www.bachmanntrains.com/home-usa/catalog/?function=detail&id=256 Maybe oversize, but it has at least got the right number of wheels under the loco, The tender would need to be shortened as well. Probably you could get away wth a "Gordon" 4-6-2 if you hide it under the armour. The bofors antitank rifle was the 20mm cannon M/40 (which would fit on mountings available), sometimes referred to as a Madsen gun. I regard minimum guage as infinite - If anyone manages to build a man carrying train on 6.5mm track, then I'll try to model it in G-Scale! I realize this is way off this thread, but there was mention of suitable starts for a CPR Pacific. Having had a ride at the RHD last weekend I can add a few bits of info. In the RHD exhibition at New Romney there is a model in a glass display case which looks like 9mm gauge, could be the same one. Unfortunately due to the glass I couldn't get a decent pictre..
my guess is that it is made out of plywood, I can't see them rebuilding a real loco. I also read that the Lewis guns were replaced with Bren guns later during WW2. 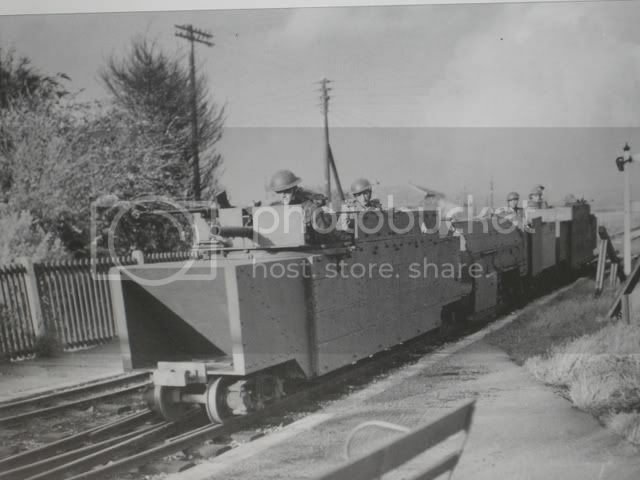 Hercules and the 2 bogie wagons were kept continuously under steam and when not touring the line (which was also used to transport troops) they were kept in a false hill built on a siding. A further note was that both Hercules and Samson were both built to transport freight trains on the RHD. Gun firing gunutters coff coff Who will be the first to model it? mogbass01 wrote: Gun firing gunutters coff coff Who will be the first to model it? I have gone as far as 1:24 scale drawings. Do you realise just how big the loco and two bogie wagons are Probably longer than some of the mini layouts on this group. That is a very frustrating picture. I'd really love to see what was under the wraps. Bren guns replacing the Lewis guns. That is a new on on me but makes sense. They probably had the large 100 round drum magazines. 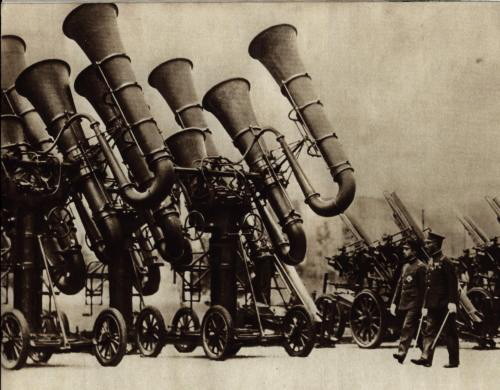 I have been told the Boyes were replaced by Bofors but I don't gnow what sort. Hills on Romney Marsh are even more mind boggling! Not far from the RHD station at Romney Sands there are three different sound mirrors (the only place in Britain where all three designs are located). However they are located on an island in a gravel pit so you can only visit them on special occasions. A rare opportunity to visit the Sounds Mirrors of Lade Pit. The walk will be led by Dr Scarth, the world's expert on sound mirrors, who will tell the fascinating story behind them. Meeting point is at 2pm in Lade car park on Coast Drive (approximately half way between the Pilot Pub and Romney Sands) (TR 085 208). It is free of charge but donations are appreciated. No booking is required. I'd never heard of acoustic mirrors before this thread. edit, perhaps this Japanesse design is more Gn15ish. Failure is just success rounded down.